I spent some time at Silver Springs State Park in late May. This is Florida’s newest park, created in October of last year when the former Silver Springs and Wild Waters commercial attractions were merged with Silver River State Park. Lynn and I used to visit when our kids were younger and the commercial attractions were going strong. But that was a while ago and it’s a different place now. Florida’s renovating Wild Waters and has already re-opened some of the water rides. The Glass Bottom Boats still run in the Silver Springs area, although the jungle river boat tour and antique car museum that I remember from past years are gone. It’s a little soon to say what the park will look like after the state is finished merging the areas together, but it always was and still is a fine place to visit. There are hiking and biking trails throughout the park, but I think the real attraction is the water. You can rent canoes and kayaks or bring your own, and there are several places to put in. I used the launch close to the headwaters. It’s a short paddle to the main spring. It’s also very close to the Fort King paddle trail (where the Jungle Cruise used to go) which is open to paddlers now for the first time since the 1800s! In addition to the put in I used (off the Silver Springs parking lot) there’s also one inside the main park, but it’s about a 1/2 mile carry to the water – too far for me! One other place you can put in is at Ray Wayside Park where you can paddle upstream to the spring. Silver Springs also offers guided kayak tours and a shuttle service to / from Ray Wayside. Here are a couple of articles from other sites about paddling at Silver Springs. Take a look – they like it as much as I do! If you can’t go on a paddle, at least ride the glass bottom boat or take an air boat excursion. You’ll get to see more of the scenery and wildlife than you can from the land. Tripod/Monopod: I did have mine, but didn’t use it as much as I thought I would. It’s a very wooded area and landscape opportunities aren’t as numerous as they are in some other places. Lenses: Bring what you can carry. I got the most use out of a normal range zoom (~24-70), but longer and wider would be nice to have in your bag if you need them. If you have any waterproof equipment, bring it for paddling expeditions. Best time to visit: It’s starts getting very warm in May and doesn’t cool off until September or October, so plan accordingly. If you’re going on the rides at the water park or kayaking, the heat is a bit more tolerable. I went during the week. Weekends will be crowded. There’s a variety of wildlife, but not as much as some other locations in Central Florida. For instance eBird lists 112 species at Silver Springs vs 293 in Merritt Island National Wildlife Refuge. I spotted Ospreys, Cardinals, Black Vultures, Red-bellied Woodpeckers, a few wading birds, Alligators, Deer, Turtles, Cormorants (on the water and in nests, and one swimming underwater), Barred Owls (calls and one in flight), Hawks and a few other species. There are recent reports of Manatees in the springs. And although I didn’t find any, there’s a troop of feral rhesus macaque monkeys descended from ones let loose in the 1930s. The River side of the park is home to the Silver River Museum and Environmental Education Center (open to the public on weekends and holidays). Tours through the pioneer cracker village are offered once a month, except in the summer. You’ll have to call the park for details. Finally, 60 campsites are available along with 10 very nice, two bedroom cabins. I’d recommend staying for one or two nights so you have some time to explore. There are also several other great areas nearby including the Ocala National Forest, Rainbow Springs State Park, Juniper Springs Recreation Area, and Salt Springs Recreation Area. Click on any of these photos to go to Flickr where you can see larger versions. My Silver Springs album on Flickr includes these and a few other photos. Silver Springs State Park is a wonderful place to visit and an especially wonderful place to paddle! P.S. – In the good news department, it looks like those of you that subscribe to the blog via email are getting the updates. If you’re having any issues, please let me know. If you search the web for “Haulover Canal” you’ll get many hits on fishing and kayaking there. I haven’t tried the fishing, so I can’t really comment on that, but I see people (and dolphins!) fishing there all the time so it’s probably pretty good. I have kayaked there many times and it’s a wonderful place to paddle and to photograph too. Haulover Canal is in the Merritt Island National Wildlife Refuge and it’s part of the Intracoastal Waterway. It connects Mosquito Lagoon with the Indian River. You can launch your Kayak at the Bairs Cove boat ramp on the south side of the canal, but we use a better spot on the north-west end of the canal. Heading north along the Courtenay Parkway, take the first left after the bridge and follow the dirt road to the end where there’s a sandy bottom put in. There’s a fee to launch from Bairs Cove, but not from the north side. 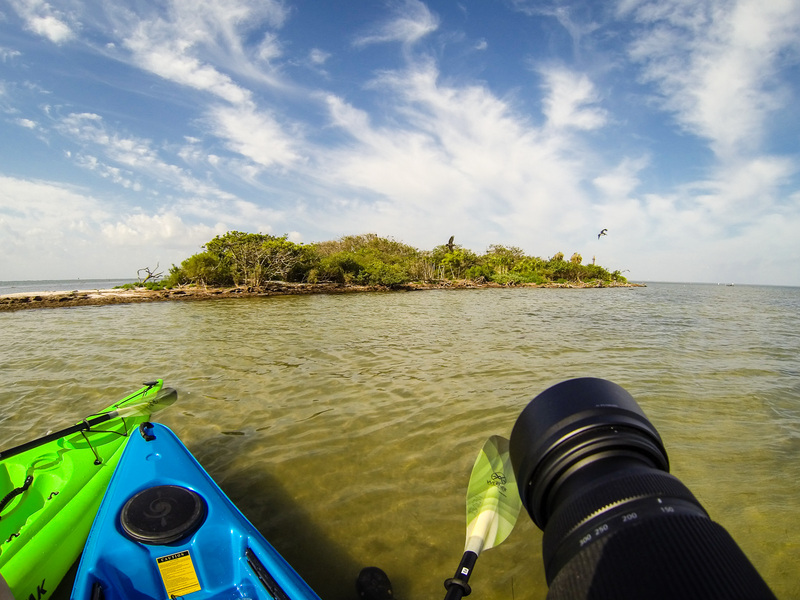 From the put in, you can paddle west and circle around Mullet Head Island where there are usually quite a few birds. We’ve seen Redish Egrets, Great Egrets, Tri-colored and Great Blue Herons, Pelicans, Cormorants, etc. there. It is a protected nesting area, though – so you’re not allowed to get too close. We usually paddle east along the canal and stop back in Bairs Cove, where we’ve seen manatees every time we’ve been. They’re very docile and sometimes friendly. You’re not allowed to harass / approach them, but if you sit quietly in your kayak, sometimes they’ll harass you! You can paddle further east and go under the bridge to a manatee observation deck along the north shore. However, I’ve never once seen manatees there. Do you think the manatees enjoy the joke? We frequently see Bottlenose Dolphins too and they’re often feeding. This one was near the launch point and made a fuss chasing fish before swimming off. There are even a few landscape opportunities, although I haven’t made it over for sunrise or sunset yet. This group of struggling trees caught my eye. You’ll need to watch for boat traffic, but since it’s a no wake zone, it’s fairly safe for kayaks. If you haven’t kayaked before and want to have a little support when you make this trip, A Day Away Kayak Tours is close by and very helpful. They’ll take you on a guided tour or rent you a kayak so you can go on your own, too. All the photos in this post were made on kayak trips using a variety of cameras. I now have enough experience with our boats that I’m confident in the water and not afraid of tipping, but splashes from paddles and waves are still a worry where camera gear is concerned. A dose of saltwater is not too healthy for most normal cameras. So I’ve been using an Olympus TG-2 and a GoPro Hero3 (both waterproof) on these trips. It’s great not having to worry about water damage, but I do miss some of the higher end photo capabilities (e.g. RAW format, interchangeable and long lenses, etc.). So I’ve taken the higher end gear out once or twice. In the photo above I really photo-geeked and used the GoPro to make a photo of myself making a photo with the Olympus EM5. And you can find out more about Merritt Island National Wildlife Refuge in these posts. Thanks for stopping by and reading my blog. Now – go make some photos! And go for a paddle too! Mary and I took our kayaks to Shingle Creek last week. I wanted to post a few photos to show you again how pretty this area can be. Winds are usually calm early in the morning – leading to scenes like this. It was a calm morning, but the current was strong – probably because of all the rain we’ve had recently. Shingle Creek gets narrow in spots. If you go kayaking, watch for it and turn around before I did so it doesn’t knock you up against the cypress tree knees! The reflections weren’t as pristine after Mary paddled through them – but the sunbeams made up for it. I’m still building my kayaking skills and I’m not yet confident enough to take non-waterproof gear out with me. I made the top two photos using a GoPro camera mounted on the bow of the kayak. I set it to make a shot every few seconds and compose by positioning / pointing the kayak and selecting from the results. It’s a bit hit or miss, but I usually manage to get some I like. The GoPro is super small, comes with a waterproof case and has a fixed, very wide-angle lens. I like all its built-in capability but it does have a couple of limitations. There’s no viewfinder, although there’s a model with wi-fi and an iPhone app that lets you control it and see the output. I don’t use my iPhone on the kayak, since I don’t want to drop it in the water either. Also, like most small sensor cameras, the dynamic range is limited (compared to larger sensors and shooting in RAW format) – so highlights have a tendency to overexpose. But if you work within its capabilities you can capture great images. You can also try the old Black and White trick to hide any blown highlights.